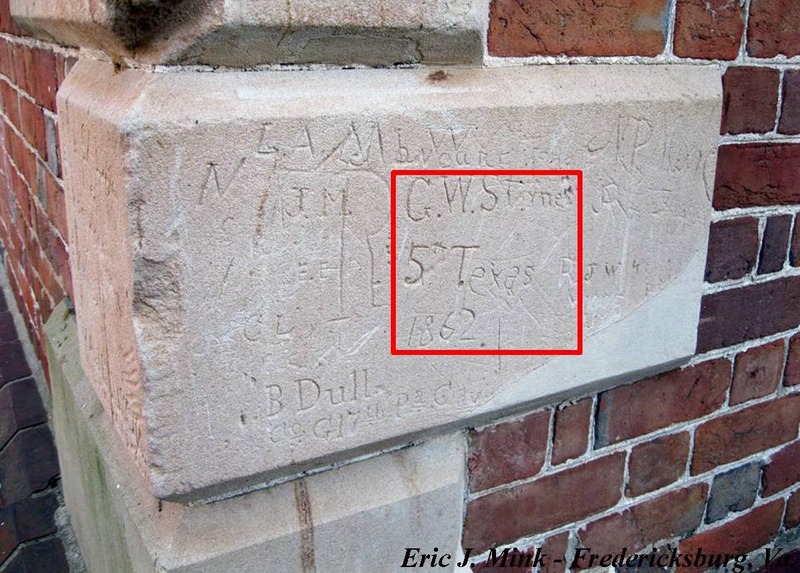 The following is the first in a series of three posts documenting Civil War graffiti at Aquia Church in Stafford County, Va. For a listing of all posts dealing with soldier graffiti in the Fredericksburg area, click here. Stafford County, Virginia’s role in the Civil War is most frequently identified with the Union Army of the Potomac’s encampment during the winter of 1862-1863. The county had, however, felt the stress and strain of an earlier “occupation” when elements of the Confederate Army of the Potomac spent the winter of 1861-1862 encamped within its boundaries. Soldiers from both armies left their mark in Stafford and perhaps no place in the county shows the personal reminder of the Civil War better than at Aquia Church. Stafford County found itself on the front lines during the first year of the Civil War. Following the July 1861 Battle of Manassas, Confederate General Joseph E. Johnston’s Army of the Potomac developed a defensive line that spread across Prince William County, Virginia, protecting the approaches from Washington, D.C. The Confederates also erected batteries and defenses along the Potomac River in an effort to hamper Union naval and shipping movements. This line was defended throughout the first winter of the war and as the Potomac River forms the eastern boundary of Stafford County many Confederates established camps throughout the region. Telegraph Road was a primary route between Fredericksburg and the Confederate winter quarters in northern Stafford and Prince William Counties. Fredericksburg served as an important supply point and also housed Confederate hospitals during that first winter. 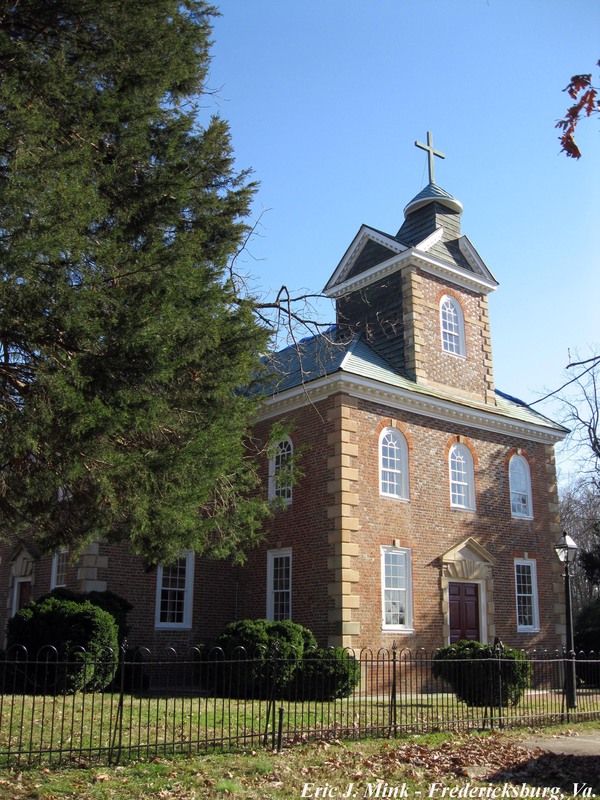 As a prominent landmark along Telegraph Road, Aquia Church saw its fair share of visitors. In early November 1861, the Fourth and Fifth Texas infantry regiments arrived at Brooke’s Station in Stafford County. They continued northward to Dumfries, where they joined the 1st Texas and Eighteenth Georgia regiments, thus creating what would become known as the Texas Brigade. The Texans spent the next few months camped at Dumfries, guarding the Potomac and other nearby points. They also found time to visit Aquia Church. The quoins on Aquia Church are covered with graffiti. Much of it is illegible, much of it is from the 20th century, but there do remain visible names, initials and Civil War military designations carved into the soft sandstone. 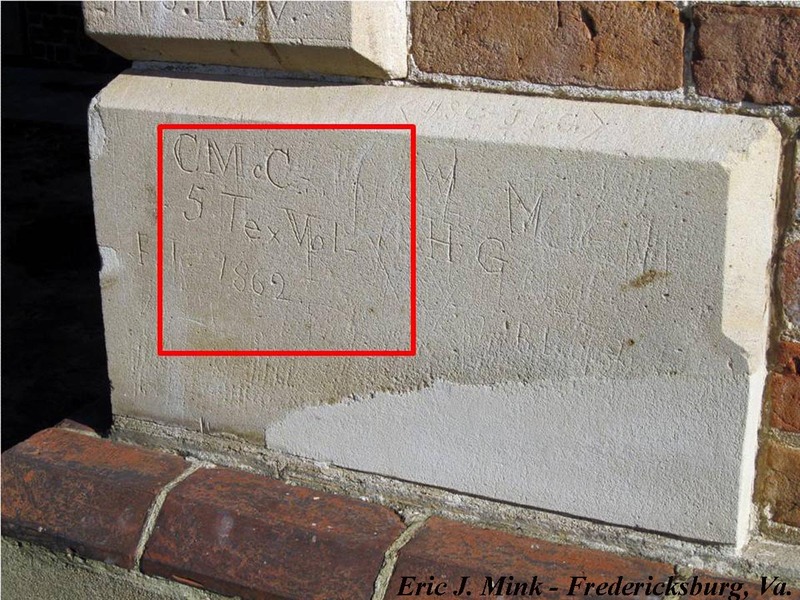 Three pieces of soldier graffiti can be attributed to members of the 5th Texas. McCally received a promotion to the rank of corporal on January 1, 1862 and to sergeant on November 1 of the same year. Through most of 1863 and early 1864, McCally served as clerk for the regimental adjutant before being promoted to 2nd Lieutenant. With the promotion came a transfer to the Corps of Engineers and assigned to duty at the headquarters of General Edmund K. Smith. An amusing story written by McCally’s tent mate is worth repeating. Following the Gettysburg Campaign, the 5th Texas found itself camped at Bunker Hill, Va. for several days with nothing to do but spend its time “sitting, or lying down, patching up.” Some members of Company F discovered a stash of several barrels of whiskey. The men filled their canteens with liquor and embarked on a two-day bender. Benjamin Wickliffe Bristow was born September 7, 1838 in Morgan County, Illinois. Benjamin graduated from Rush Medical College in Chicago in 1859. On June 21, 1861, Bristow enlisted, for the war, as a private in Company E, 20th Mississippi Infantry at Corinth, Miss. He transferred to Company C, 5th Texas Infantry on January 1, 1862. He survived the early campaigns until wounded in the hip on August 30, 1862 at the Second Battle of Manassas. Sent to Chimborazo Hospital No. 5 in Richmond, Va., he commenced a furlough in November to recover from his wounds. On June 10, 1863, Bristow received his discharge from army service. Apparently not content to sit out the war, Bristow put his education to work. In March 1864, Bristow is listed as a surgeon on duty at the Confederate General Hospital in Columbia, Texas. On November 30, 1864 he received an appointment as an assistant surgeon in the Provisional Army of the Confederate States. His duty station was the General Hospital in Houston, Texas where it appears that he served out the remainder of the war. After the war, Benjamin lived in Texas. The 1870 Census lists him as living in DeWitt County with a wife and two children. His occupation is given as doctor. The 1880 Census lists him as a physician living in Flatonia, Texas with his son. On July 13, 1896, Dr. Bristow was shot and killed by Trotter Hopkins, the brother of Bristow’s daughter-in-law. He is buried in Oak Hill Cemetery in Flatonia. “G.W. Starnes 5th Texas 1862.” The Union soldier's graffiti will be discussed in a later post. George W. Starnes enlisted in Company F, 5th Texas Infantry on August 10, 1861 in Harrisburg, Texas. Starnes was appointed sergeant on November 22, 1861. Like Bristow, Starnes fell to a wound at Manassas on August 30, 1862. Due to this wound, he was left in Warrenton, Va. when the Confederate army moved north and then subsequently fell back into the Shenandoah Valley. While in Warrenton, Union authorities captured Starnes and presumably paroled him on September 29, 1862. Starnes succumbed to his wound on December 21, 1862. On April 8, 1862, The Texans abandoned their camps near Dumfries and headed south to confront Union General George B. McClellan’s massive military buildup southeast of Richmond. Among the things they left behind were their names carved on Aquia Church, to remind us of their time spent there in the first winter of the war. 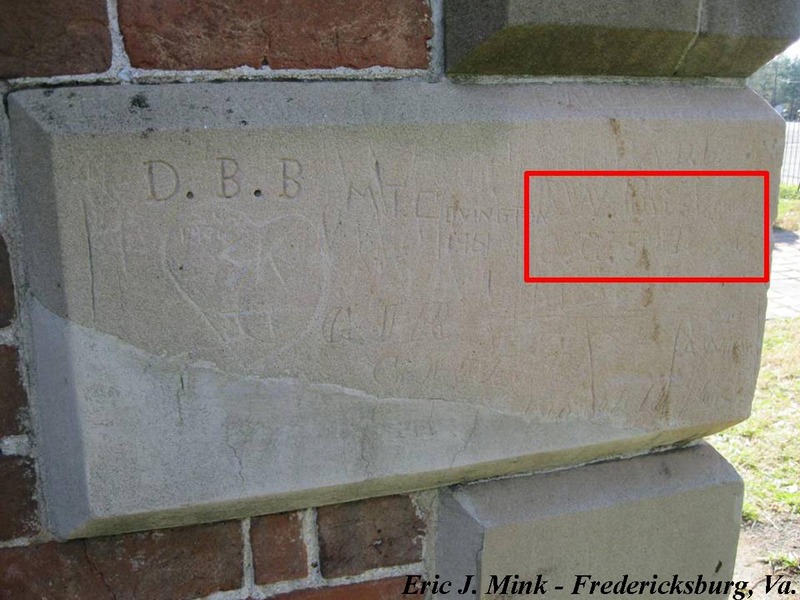 A second post will follow, focusing on some of the Union graffiti that remains on the exterior of the church. Looking forward to the next two installments. Nice work. Fascinating, Eric. One of my ancestors, John P. Kale, also served in the 5th Texas. John’s father Anthony Kale owned a grocery and candy store on Caroline Street. That building still survives as the Fredericksburg Visitor’s Center. Very interesting about his name being carved into the stair rail. I can give you a little information about Moses Babcock. He originally enlisted in Gl. G, 22nd Maine Infantry, but never was mustered in. He enlisted as a Private in Co. D, 6th Maine Infantry, on Sept. 16, 1862 and was mustered in at Augusta, Maine on Sept. 22, 1862. At enlistment, he was 25, single, with dark complexion, blue eyes, brown hair, a lumberman, and stood 5′ 5 3/4″ tall. He was born in Chester, Maine and resided in Mattawamkeag, Maine. He was absent wounded since May 10, 1864. He was transferred to the 6th Maine Battalion on July 14, 1864 and transferred to the 1st Maine Veterans Infantry on Sept. 20, 1864. He was discharged for disability on April 21, 1865. The history of the 6th (“No Rich Mens Sons” by Jim Mundy) says the was also wounded May 3,1863. We do not have any Grave Registration Card for him, so do not know when or where he died. He is not listed in the Post Civil War Address books for the 6th or 7th Maine Infantry. He is not listed in the 1890 Civil War Veterans Census. He is also not listed in the Medical and Surgical History of the Civil War. Chris – That’s very cool information. I didn’t know there was graffiti inside the church. Now I must come up and get a picture of Babcock’s carving. The answer to figuring out what happened to Babcock may lie in both his and his mother’s pension applications at the National Archives. It appears that he applied for a pension based upon his service. His mother also applied for a pension, based upon his service, no doubt claiming she was dependent upon his income and ability to work. The next time I am up at the National Archives, I’ll pull the files and see that they say about Moses’s postwar activities. I’ll be sure to pass along what I find. Eric – In view of the sesquicentennial of the war, and Stafford County’s 350th in 2014, would you be agreeable to Aquia Church documenting your research – attributed appropriately, and having available as a ‘flyer’ or trifold, for visitors. As you may know, we host visits from school children, out of town visitors, extended families, etc., and many find the graffiti fascinating. Your research is wonderful, and I’d like to be able to share it with visitors….though, these days, perhaps all we’d need to provide it is the URL to this (and subsequent) pages. Thank you for the post! I am a descendant of the founders of aquia, and have a hole in the cemetery awaiting my eventual coffin (not for a while, I hope!). And, coincidentally, live in Texas with a second home a mile from the DeWitt County line. I’ll visit the cemetery on Flatonia the next time in the area. Again, thanks!